Bighorn rams are supposed to be dynamic and dashing, but this guy was so unconcerned about my presence that he dozed off while I was taking his photo. 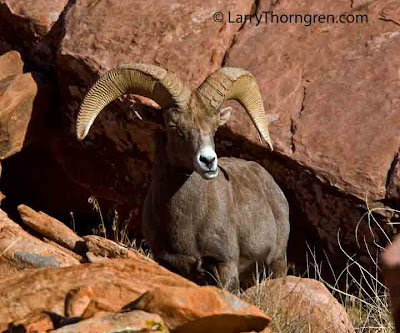 I like the way some of the desert sheep rams have horns that sweep way out to the side. I hope this guy lives for another 5 or 6 years and continues to grow longer and wider horns. I pride myself on being able to approach my wild photo subjects without disturbing them. It looks like I over did it on this ram. Labels: Desert Bighorn Sheep, Moab, Utah.